In this post I want to focus on ways to design a paddle so it orients itself in the proper direction for paddling without a lot of effort on the part of the paddler. A paddle that requires a tight grip to keep it in control will sap the energy of the paddler and cause fatigue and diminished efficiency. Not surprisingly, there is more than one way to make paddle orientation easier to control. 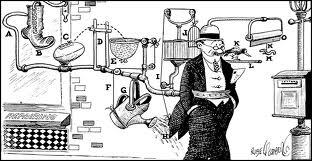 I will examine three different ways all of which can be used in various combinations. I should also mention that the intended use of the paddle, whether it is meant for racing, cruising, surfing or rolling will have an impact on how it should best be held. Most traditional paddles have oval or egg shaped looms with the longer dimension of the oval perpendicular to the face of the paddle blade. The oval shape makes it easier to keep the loom from twisting in the hand than a loom with a circular cross section. A second way to keep the loom from twisting in the hands of the paddler is to hold the paddle at least partly by the root of the blade where it joins the loom. For instance, in a shouldered Greenland paddle, the index finger and the thumb circle the loom while the other fingers and the rest of the palm circle the root of the paddle blade. The flat part of the blade resting against the flat of the palm gives the paddle stability and keeps it from rotating in the hands of the paddler. I thought at one time that it was only the Greenland paddles that were held this way, but there are some photos of Unangan (Aleut paddlers) that also show them holding their paddles so that at least part of their hand is on the root of the blade and part on the loom. A third way to stabilize a paddle is to design it so that the paddle blade naturally wants to orient itself in the right direction when the paddler pulls on the loom. This trick only works for paddles that are asymmetrical, that is paddles that have a front face that is different from the back face. When you pull this kind of paddle through the water at some random angle, it will have one face that will naturally orient itself in the direction of travel while the other face orients itself away from the direction of travel. It is like a wind vane which if put sideways into the wind will turn its head into the wind and its tail out of the wind. 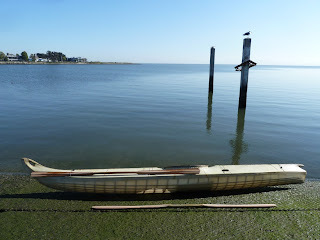 Examples of this kind of paddle are the Unangan (Aleut) paddle and bent shaft paddles in which the face of the blade slightly trails the loom as the paddle is being pulled through the water. In these two closeups of Unangan paddlers from the same boat, both paddlers are holding the paddles with the flat face toward the back. The interesting thing with these paddles is that the weather vane effect would favor holding the paddles flat face toward the front but the shape of the paddle in the areas where paddlers held it also make the opposite orientation stable. 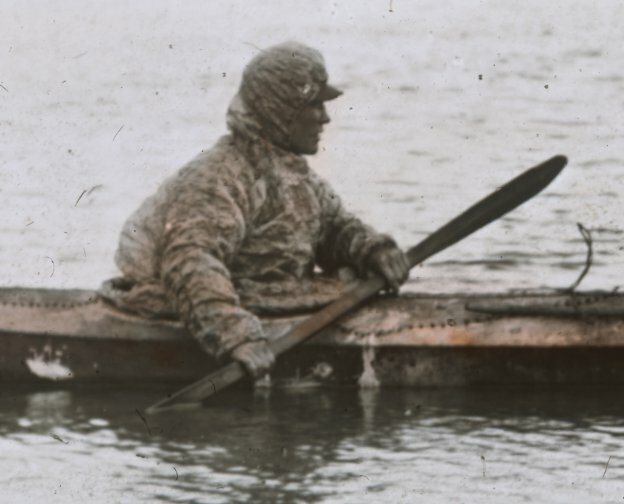 The photo was no doubt posed and both paddlers are just holding the boat in position rather than paddling forward. They may actually be paddling backward. 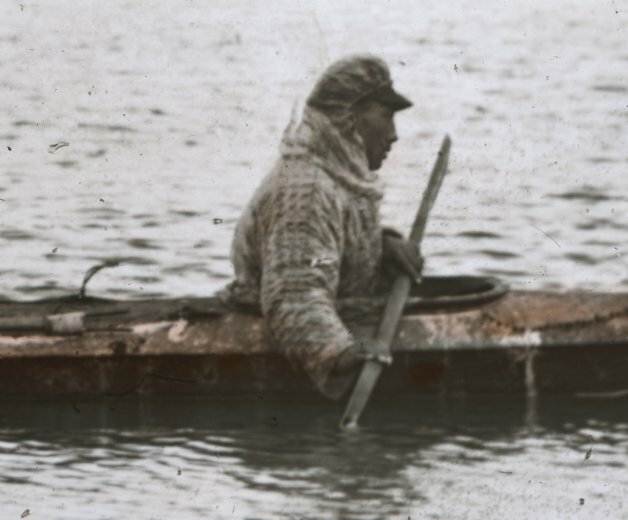 So it is hard to tell whether this is the way they held their paddles when moving along, but regardless of what was happening when the picture was taken, it seems that the shape of the loom allows the paddle to be held in a stable manner regardless of orientation. This also brings us to the question why so many commercial paddles have looms with round cross sections while traditional paddles almost without exception have looms with oval cross sections. I suspect the reason is that is simply so much easier and cheaper to manufacture looms with round cross sections. I've had two different prototype paddles kicking around for a while that I was not able to get to the point where I liked them. What I typically do when I build new paddle designs is to overbuild them and then whittle away at them until they work to my satisfaction, or at least until their performance does not improve any more. Sometimes, it is just not possible to rescue a paddle design. I have to walk away from some paddles and simply write them off as a learning experience. I generally have no idea how a new paddle will work until I actually try it out. I would like to say that the more paddles I build, the better I get at predicting paddle performance, but I would be lying. The only way I can tell what design will work is to actually build it and try it out. I should also mention that a paddle must be matched to the boat as well as the paddler to perform well. A paddle is not a good paddle in the abstract. A paddle is a good paddle only for a specific set of conditions. In this case, I happened to have my King Island kayak readily available and that became the test platform. The King Island kayak was fairly well suited to this particular paddle test because the King Island kayak's high deck calls for long paddles and the set of paddles I was testing were fairly long, 98 inches. I had already modified both paddles based on previous tests. One paddle had started out at 102 inches long and I cut it down and the other had a loom that was way too fat for comfortable use and I had slimmed down the loom on it. 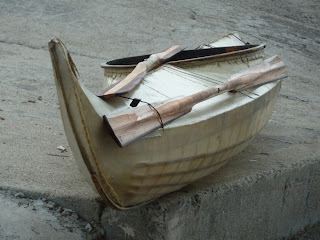 The thing about the fat loom was that it felt good in the shop, but out on the water in action, it was just too bulky. 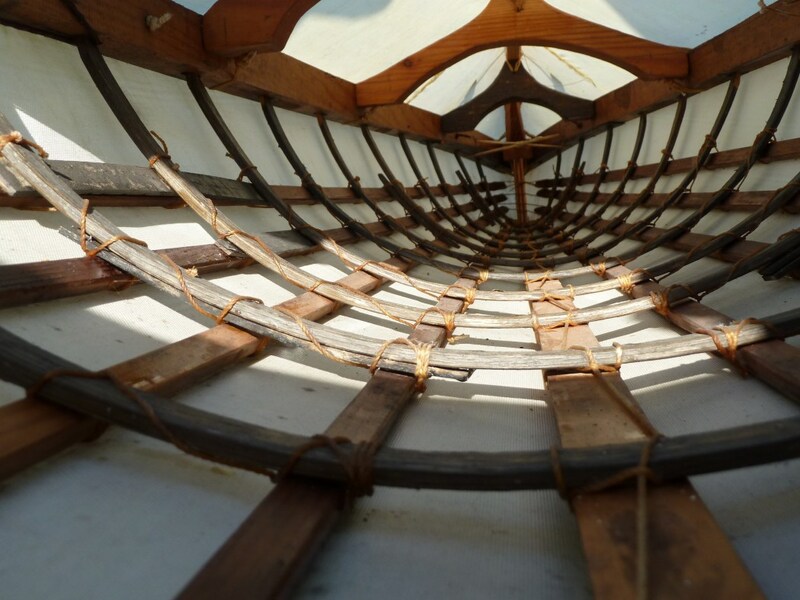 Here's a shot of the inside of the King Island kayak. Note the high deck ridge. The thing about a high deck is that it forces you to hold the paddle up higher which means that it has to be longer to reach the water. 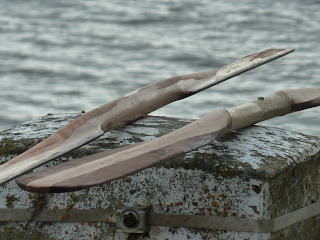 And here is a shot of the two test paddles on the deck of the kayak. The lower paddle was based on a paddle shown in an old illustration. The upper paddle is a breakdown version of a more conventional Unangan shape except for the loom. 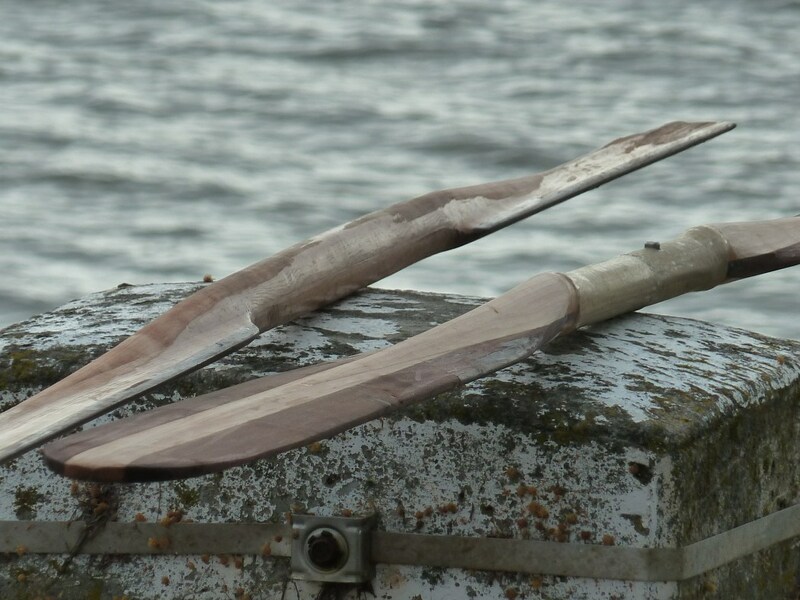 Both paddles are versions of an Unangan (Aleut) design. The Unangan paddles are asymmetrical with the loom offset from the plane of the blades. 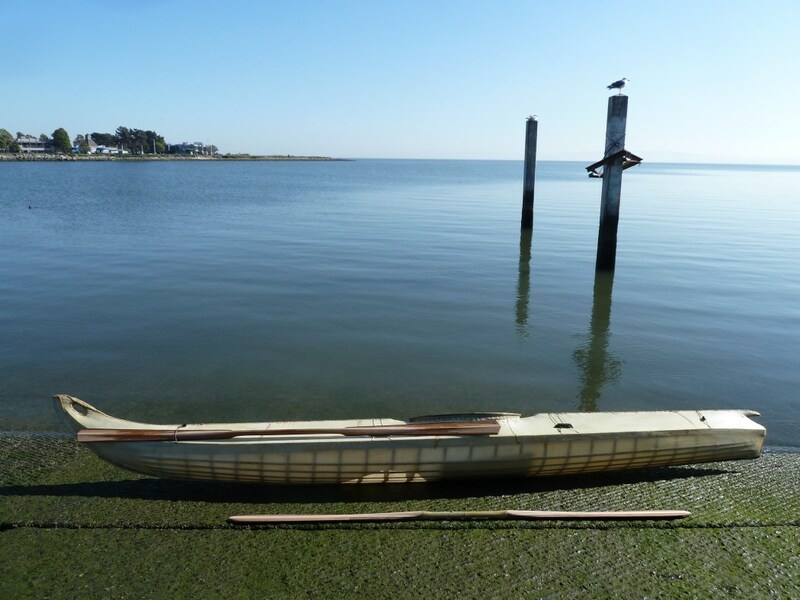 And so I had my test paddles, test boat and test pond, San Francisco Bay. Even though I had whittled away at both paddles and tried to improve their feel, I preferred the one piece paddle because it was lighter and seemed to move the boat with less effort. The breakdown paddle felt heavy and more ponderous in the water. After the initial test I did a little more whittling and then took out both paddles again and this time I had my GPS with me. The GPS gives me a speed readout which I can use to measure top speed for a boat or paddle and if I have two or more paddles, it gives me top speed for comparative effort. Effort expended is pretty much a subjective measure but on a given outing, swapping paddles back and forth several times gives me a pretty good idea of comparative efficiency of two paddles. And this is where the GPS comes in. Although one paddle may feel better than another the one that feels worse may actually be giving me a better top speed. It may feel worse because it moves more water and makes me work harder. But if I am simply cruising, comfortable feel of a paddle may be more important than top speed. Comfortable feel may also be an indication of better efficiency of one paddle over another. So to sum up, paddle design for me is a pragmatic exercise. I have to test paddles on the water to tell whether they are any good and results are often surprising. In a future blog, I will get more specific on factors that make for a good match between paddler, boat and paddle.